Yeah, I'm making a thread for Other M so those of you who enjoy spoiling the game and talking about the ending and how awesome it is. Well, I don't really know since I haven't finished it yet. But yeah, that Discussion thread was mainly for those who haven't beaten it yet and all that stuff. But yeah, anyways...I'll ask it again here. Help on the giant Metroid thing!!!! I posted this in the other thread, but I'll post it here I guess for anyone having trouble. This fight is stressful. The Metroid Queen (I think that's its actual name) releases some Metroid babies that try to latch onto you and drain your life. Using your sensedodge and/or running around like a crazed gazelle, try to blast the Metroids with a charged shot. Wait till they're all in a cluster, as your Diffusion beam will allow you to hit them all at once. The reason you want to try to hit them all at once is because if you hit them enough, they'll freeze temporarily. While frozen, blast them with a Super Missile (or, if there's a few of them frozen, you can use lock onto all of them with your whatsitface missiles). After you kill the Metroids, you'll enter a little cutscene, after which you'll be stuck in first person mode. Charge shot the monster's stomach, and when he gets up and opens his mouth, grapple beam the inside of his mouth. This will propel Samus into his belly. Quickly charge up a Power Bomb (you can use them at this point) and kill him for good. EDIT: In other news, can we discuss the ending a little? I'd be interested to read other people's opinions of it. You also might want to change the title? It sounds a little misleading. this guy nearly brought a tear to my eye. it's easy to forget him since he was a midway boss, but he really was a great enemy. it really took me by surprise, reviving one of the more obscure bosses was a great choice. also, one thing that gave me trouble after beating it was figuring out who the deleter was. the game cleverly neglects to wrap that thread up while giving you enough information to piece it together; in the end, it was james pierce. every other team member is confirmed dead except misawa, who obviously had to be the one who got tossed into lava. pierce was approaching MB to kill her i guess when she took him out instead, leaving his body there in the lab. That was really easy, except for the part where they assume you know you both have the power bomb ability and that you need to use it. I was hoping the idea of rolling into her stomach would be part of the actual fight rather than a trigger for the end of the fight. Still really cool though. ...and the game isn't over? Hmm... weird. That was really easy, except for the part where they assume you know you both have the power bomb ability and that you need to use it. Well with all the stink you made about the power bombs at the beginning of the game and how it would annihilate everything in the galaxy, it seemed like a good idea to bust one out in the Queen Metroid. Dammit it all to hell. I guess I should have gotten to the real ending before I went to this thread! Still...that's a pretty awesome ending boss. Loved that guy in Super Metroid! I guess I'll take a leave of this thread until I 100% it to avoid further irritation. hah. glad i could ruin the game for you, kid a.
Panda, yea, it's a good idea, but it doesn't even tell you that you can suddenly use it. There was no logical reason it shouldn't have been available since I (Adam) died, so I saw no reason to suddenly believe it was available now. Kid A, yea, seriously. That was a major spoiler for me, too, but I thought since I just got to Queen Metroid that I was done!! Sigh, oh well. By the way, is the very next fight after the queen even remotely possible? How many missile tanks and energy tanks did you guys have at this point? I just tried twice and did terrible. I hate being stuck in first-person. Well if you're going to withhold it, I'm just going to find a guide that won't, haha. Edit: Oh, I figured it out. Thanks! putting phantoon in other m was brilliant. he looks 10x cooler in this one! the battle was better than the final boss, in my opinion! yeah, infamous ridley cut scene was unnecessary, but it didn't "ruin the game" for me. people are overreacting. I really liked the plot, but I really wonder what was up with K.G. I really wanted to know more about the guy. Am I the only one that actually really liked the Ridley scene? Having him hatch from the white thing was really funny, though not befitting at all. Didn't bother me though. As a whole, I thought the story was fantastic, the best one in Metroid's had so far, though that doesn't say much. I feel like we should have gotten to know the other characters a lot more, but no big deal. All right, credits rolled and I've got... only 49%?! Dang, long way to go! How do I get to the phantom boss -- just follow the way points, or do I need 100%? Is there anything else that might be spoiled for me between credits and that? If so, I'll have to stop checking this thread. 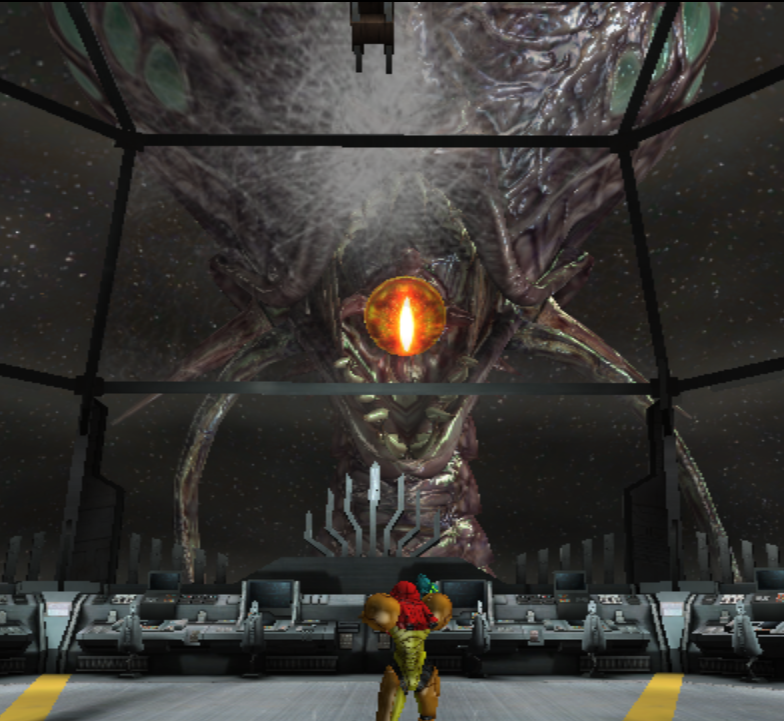 ...So, the final boss was the Queen Metroid? Was hoping for, er, I dunno...something bigger, lol. So wait, other than that Phanto, thing, are there more bosses? Optional bosses? I hope so, that would be awesome, lol. i liked the ridley scene, but i wish when samus turned into a kid that the background also would have changed to reflect the colony attack (like what you saw in the commercial). i don't think they ever made it clear that ridley attacked samus as a kid, so some people (G4) may not have known what was going on there was a flashback. Well, was it ever explicitly stated in the games that Ridley attacked her? I'm assuming so because I knew it and never read the manga or comics or whatever, but I can't remember. Oh, and you need 100% for hard mode? Dang. That'll take awhile. Might have to use a guide. I'm more interested in playing hard mode than collecting everything. Never was much of a completionist.